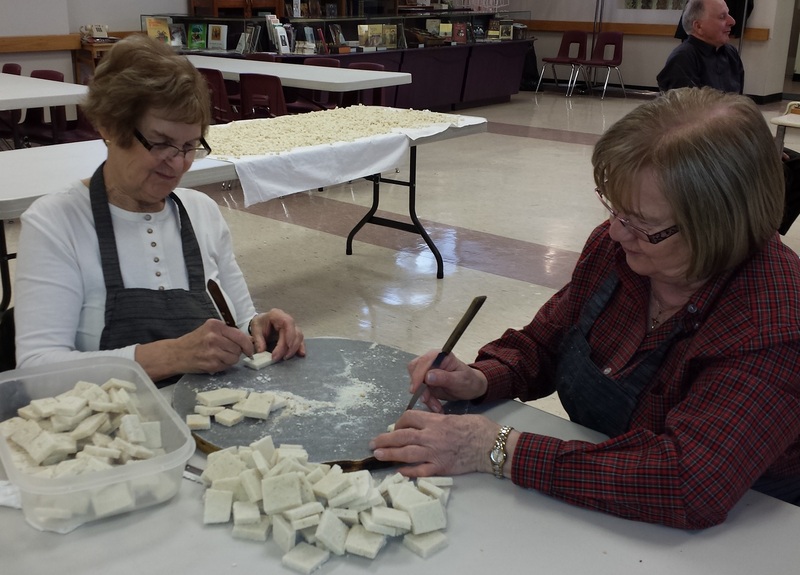 Prosphora is the special bread that is prepared for use at the Eucharistic liturgy. It is a leavened bread made from simple and pure ingredients: wheat, salt, water and yeast. One of the most distinctive aspects of prosphora is that it is kneaded significantly more than most table breads, because it must be firm must remain whole when it is later immersed in the Chalice for Holy Communion. Usually 5 (small) prosphora loaves are used for a Divine Liturgy. Sometimes a single specially-sealed prosphora is used. 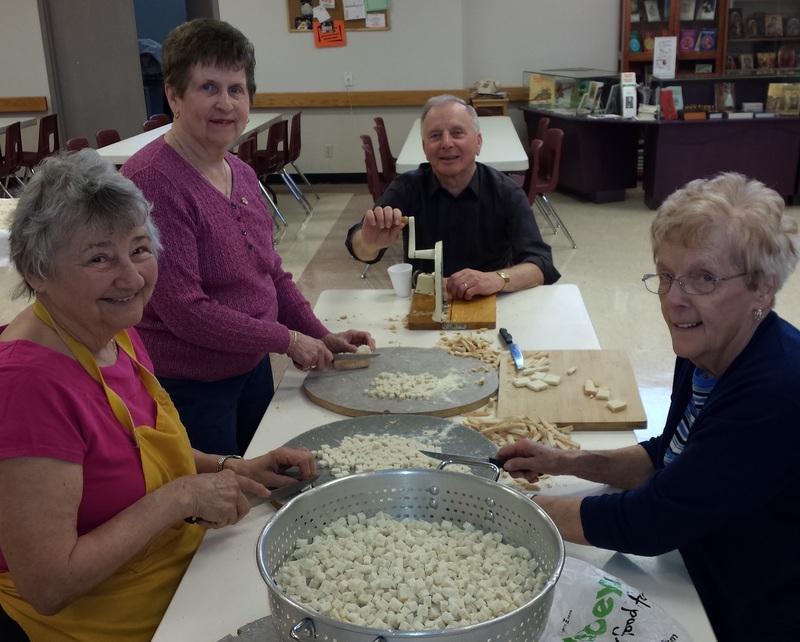 However, for the sake of convenience, the practice at Holy Eucharist Parish is to use pre-cut pieces, sliced from large prosphora loaves. This includes smaller “particle” pieces and larger squares that are used as the “Lambs”. On a regular basis during the year, Mrs. Margaret Chemerika, bakes the many prosphora loaves. They are brought to the church to be cut in preparation for the Divine Liturgy that is celebrated at least once daily in the parish church. The same bread is also baked in the form of small round loaves that are used for the “lytia” blessing at vespers on the eve of greater feastdays. 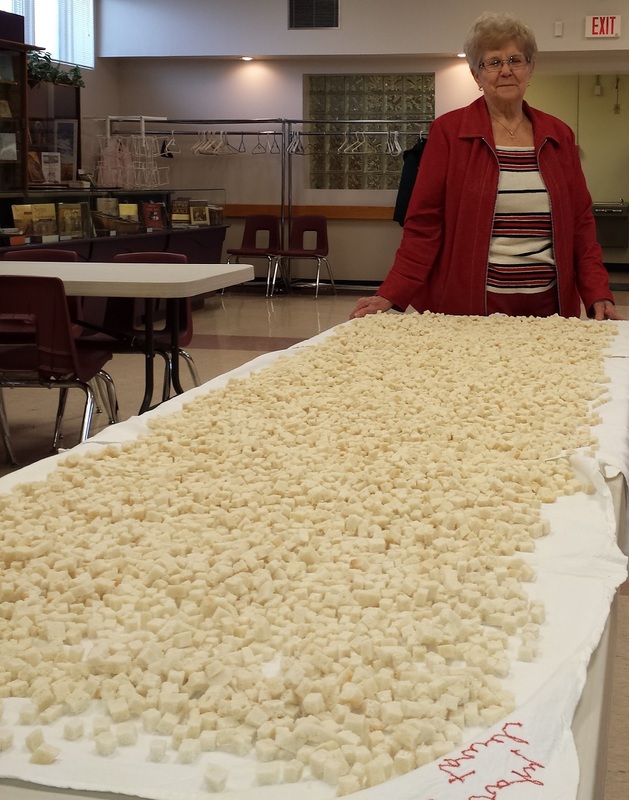 The large loaves are sliced and then individually cut by a number of volunteers from among the parishioners. They are then partially dried and stored for use in the church. A very special thank you to Joan Tataryn, Helen Mazur, Lilian Deptuch, Morris and Irene Mazur and Hope Ewanyshyn who helped this time.